With the goal of connecting with classrooms in our community, Museum London launched its London Life Art Outreach Program in 2008. Developed specifically to target schools that had not visited the Museum previously, the London Life Art Outreach Program consists of two parts, an interactive curriculum-based SMART board presentation and an in-classroom art project both inspired by Museum London's collections of original artwork. 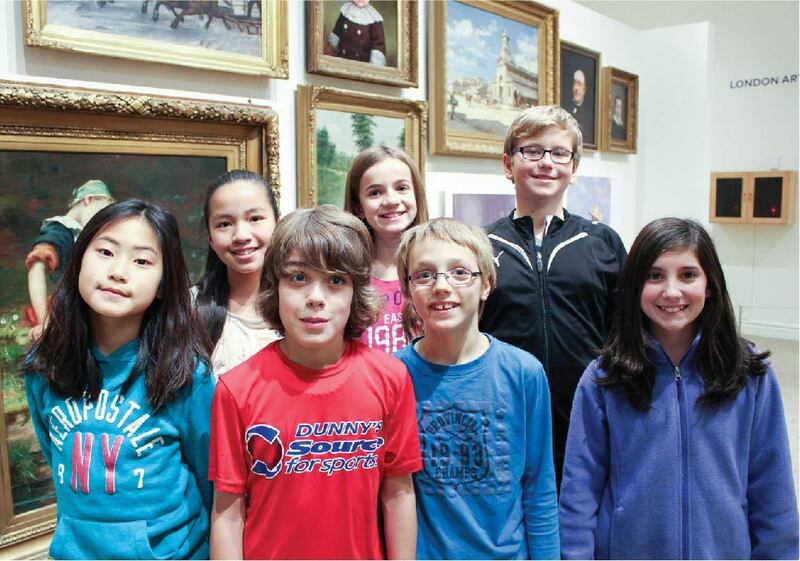 Following the London Life Art Outreach Program in their classrooms, students have the opportunity to visit Museum London for a tour and studio program made possible through a bussing subsidy and a reduced program fee. Approximately 800 elementary students take part in the Art Outreach Program each year. The presentation for the grade 6/7 class was very engaging and informative. Students learned about two prominent London artists. The use of the Smart board was an excellent approach for the students as this is their common method of acquiring lessons in class when taught by their regular class room teacher. The students were engaged and involved. Again, I would like to thank you for this wonderful opportunity given to our students. Involvement in community activities is a key component in opening the eyes of our students and to help them see beyond what they are taught in school. Thank you also, for the follow up trip to the Museum. We look forward to seeing the art collection. This will reinforce the lessons provided by your team. My class enjoyed the outreach program. I liked that they got to interact using the Smart board and do their own project afterwards. It covered important areas of the curriculum. I know my Grade 3/4 class really enjoyed the hands-on portion of your presentation. The Smart board portion was very educational. If I had a Smart board in my room, I would follow your lesson outline with the Smart board lesson first and then follow-up with the activity for all of my Visual Arts lessons. My students are looking forward to the Museum visit as most if not all have never had such an experience. I too am looking forward to the visit. Thank-you for providing this opportunity to our students, it is very beneficial and appreciated. This outreach program was a fantastic opportunity for the students in our school. They thoroughly enjoyed the presentation and were able to remember important details about local artists. I believe this knowledge will mean much more to them after their visit to see the artists' work at the museum. The presenters were helpful and cheerful when working with the students. This whole experience is one that many of our students would not otherwise be able to take part in, if it had not been funded so generously. We certainly appreciate it! Julie Baczynski, JK/SK Prep Teacher, Lord Elgin P.S.